The Irresistible Community, Bill Donahue. Grand Rapids, Baker Books, 2015. Summary: Looking at the upper room narratives, Donahue explores how Jesus created community through the table, the towel, and the truth. As I sat down to write this review, I found my fingers stumbling over the correct spelling of “irresistible”. Then I found myself stumbling over the concept. Was the community Jesus formed in the upper room truly irresistible? I don’t think Judas would have thought so. Frankly, I think this title is a bit of publishing hyperbole. What I do think Donahue has done is describe three marks of a community that changes lives under the leadership of Jesus, and this is in fact an important contribution to the life of our churches and other places where Christians gather and attempt to be “communities”. The first of these marks is that they are communities that welcome all to Jesus’s table. This involves practicing good table manners from welcoming, to seeing and being the truth, to establishing trust, forgiving, and settling for progress rather than insisting on perfection. Donahue talks about different kinds of tables from the kitchen table to the coffee table to the conference table that each are appropriate at a certain stage of community life. Tables are places of stories, places where we take time to hear each others stories and consider how they come together in the story God is telling through this community. Our encounters in truly welcoming each other at the table lead to the ministry of the towel, the challenging work of learning to truly serve each other in community. There is the issue of being clear about our identity as serving communities–do we embrace this and clearly understand how we are called to serve? True serving means our towels will get dirty as we jump in where we are needed. True serving means keeping our towels in a circle, remaining accountable to and responsible for each other. True serving means leaning into the sources of renewal when we are tempted to throw in the towel. Donahue uses an interesting device to open each chapter. He begins with an “interior narrative” of what each of the twelve disciples at the table are thinking as they sit around the table in the upper room. Each is paired to the content of the chapter. Welcome. Service. Truth. I do think these are marks of healthy communities. But not all will accept our welcome. People will turn away from our service. And sometimes holding to the truth, however lovingly, will turn away those not ready to face the truth, particularly about themselves. 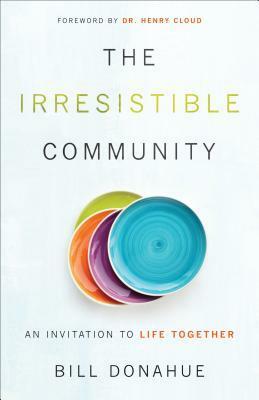 So, while I find the community Donahue describes authentic, transforming, and real, I still don’t get the irresistible. But I think we can learn things from the community he describes that will benefit the communities of which we are part. That’s good enough.